As I tell pilots time and time again, "if it isn't with you, it can't save you™." This is even more critical for overwater flying. A constant wear inflatable life vest that you don't need to put on if you have to ditch is essential. It only makes sense to include your most critical survival and distress signaling gear with the vest. A portion of the proceeds from the sale of each Doug Ritter Essentials™ Overwater Aviator Survival Vest™ goes to support the non-profit Equipped To Survive Foundation. Based on Switlik's innovative X-Back Life Vest, Doug Ritter has outfitted the vest with the essential survival gear you should have with you for overwater flights. 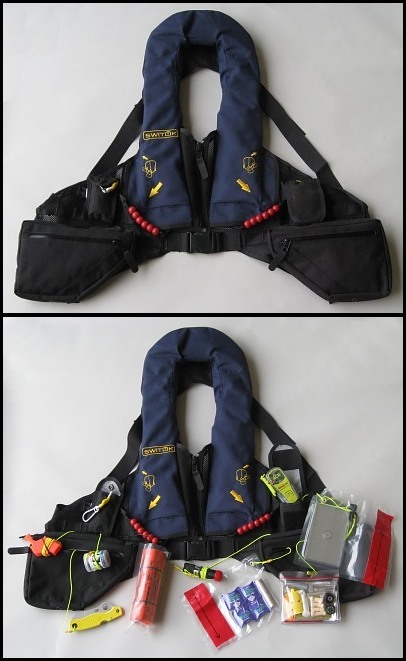 This FAA TSO C13d approved life vest provide reliable lifesaving performance with modular storage pockets for distress signaling and survival gear and it is comfortable to wear in the cockpit. With this vest and the included survival gear you will be prepared for your next overwater flight. NOTE: The Vest is now available in either Blue with Black pockets, as shown, Orange with Black Pockets or all Black. The exterior cover is constructed from a blended Nomex/Kevlar Rip-stop weave fabric. The material is soft and comfortable to wear. The Kevlar component provides excellent durability, while the Nomex gives you in-cockpit fire protection. The vest incorporates Dual Manual CO2 Inflation with oral inflation back-up and Dual Independent Buoyancy Cells for redundancy and safety. The vest provides over 35 pounds of buoyancy, in excess of minimum FAA and U.S. Coast Guard requirements. The short length provides added comfort while flying. All survival gear is tethered to vest with braided nylon line to prevent loss. Stainless steel spring clips allow for ready removal or to change around components as desired. The Vest is priced with two standard storage pockets, the buddy line and a cell phone/PLB pocket, but additional optional MOLLE compatible pouches and pockets are available for added capacity or specialty equipment (Contact Doug Ritter for availability and pricing). All attach using the PALS webbing on the vest and you can adjust positioning to suit your needs. A 6 foot (1.8 m) 550 lb. test Buddy Line with a lightweight clip on the end is provided to keep survivors together. An FAA TSO C85 approved Locator Light illuminates automatically upon water immersion. Each come with a fully illustrated Instruction Manual covering the vest and the survival gear included. 1 Rescue Technologies Aviator RescueStreamer® floating distress signal, 6 in. x 40 ft. NOTE: ACTUAL PRICING SUBJECT TO CURRENT SWITLIK PRICING - It has proved immpossible to keet this current, will price out upon order. Or, email us or call us at 480-219-7271 and we'll get the current price for you. If you do not have a PLB or your PLB is an older generation, heavier and larger PLB, we suggest the ACR ResQLink 406 MHz GPS PLB: These are readily available online and we no longer can get wholsale pricing on individual orders from ACR, so we do not sell them with the vest anymore. A lanyard is provided for the PLB. Please allow 5-6 weeks for shipment. Doug Ritter reserves the right to substitute, add or withdraw components at his discretion. A portion of the proceeds from the sale of the Doug Ritter Essentials™ Aviator Survival Vest™ supports the Equipped To Survive Foundation. Click here to learn more about the Equipped To Survive Foundation. A portion of the proceeds from the sale of Doug Ritter Gear supports the non-profit Equipped To Survive Foundation.